The Three Horsemen of the Rubicon? 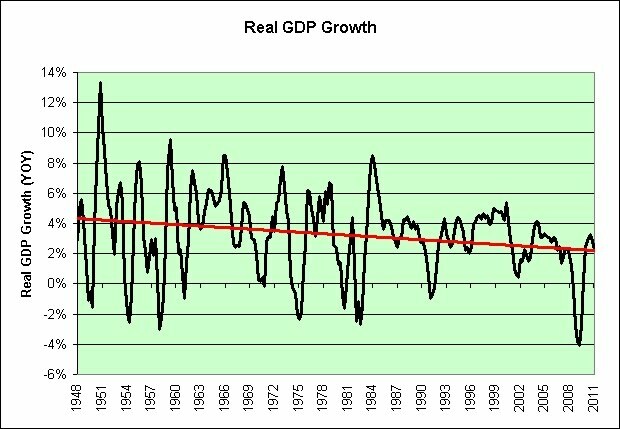 This is a companion to my last post on Real GDP Growth and the chart that went with it. Now let's talk about real debt per capita. 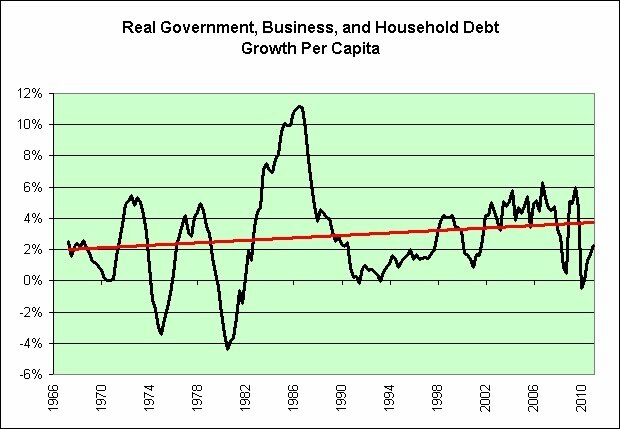 I'm adding up government debt, business debt, and household debt and adjusting it for inflation and population. This should show how much of a burden it is becoming for each of us (and our grandchildren). 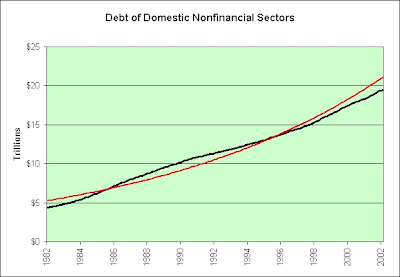 Here's a look at the annual growth in that debt. 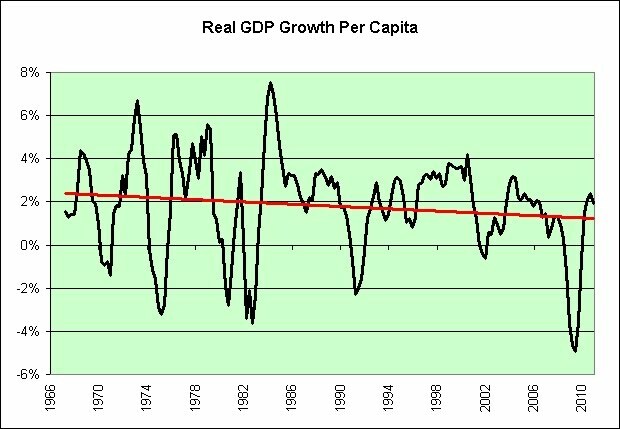 Now let's adjust the first GDP chart for population growth so we can make an apples to apples comparison. We will also trim the data so the time periods match up (1966 through 2010). 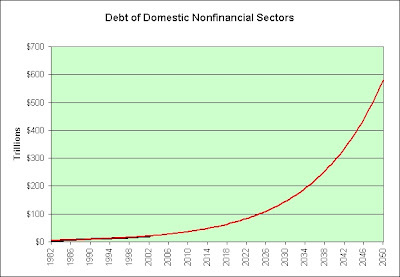 We've been borrowing from the future in order to boost the economy of the present. It is no longer as effective as it once was. Apparently the future is now. These charts inspired by Charles Kiting from the comments of this post. 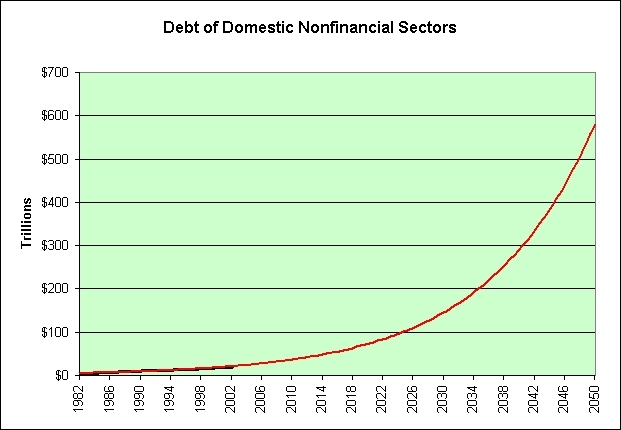 He said, "Looks like a 30-year credit bubble to me." First the good news. We're back on trend. Now the bad news. We're back on trend. 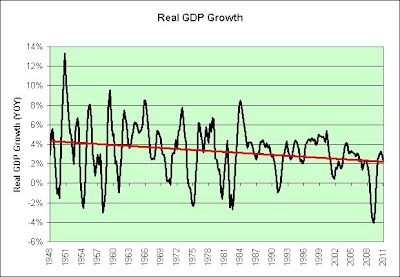 He didn't seem to have any problems with long-term TIPS paying a real yield of 3% to 4% when real GDP growth was 3% to 4%. In fact, that was the very math he used. So why is it so hard for him to understand that earning a real yield of 2% when real GDP growth has been 2% might not be such a bad thing? I have a theory. Treasury Inflation Protected Securities tried to run over Jeremy Siegel's dog. What else could possibly explain his ongoing hatred of them? Well, other than the fact they've made him look like a fool for the past decade by outperforming his precious stocks. Just three? Didn't the legend imply that there would be more? Which one are we missing? You may be a lot wealthier than you think. Most people look at their 401(k) or other retirement plan, add in the value of other assets — their home, other investments, savings, etc. — then subtract their debt to get their net worth. After the housing-market bust and the bear-market rout of recent years, that number may look painfully small. But what's the value of you? That is, how much are your future paychecks worth? That number is your "human capital" — and some experts say it should be a key part of your overall financial planning. Yes. Let's factor in the value of those future paychecks in a world that increasingly automates and outsources jobs away. And let's not forget that there are other ways to value human capital. This would be especially true if food prices continue to rise. See? Things don't look so bad now. Do they? How much is my body worth? You're worth more than you think! I knew it! We now have proof! When we total the monetary value of the elements in our bodies and the value of the average person's skin, we arrive at a net worth of $4.50! I must admit that I have not included this $4.50 in my personal finances. Shame on me! Instead, such tax cuts create an illusion of prosperity while the national debt continues to increase. I might be more than a bit biased here, but I somehow tend to agree. This is a followup to a post I did back in August. For those who love precision, there were actually 36.2 million missing jobs. It has been 8 months since that post. Here's the update. 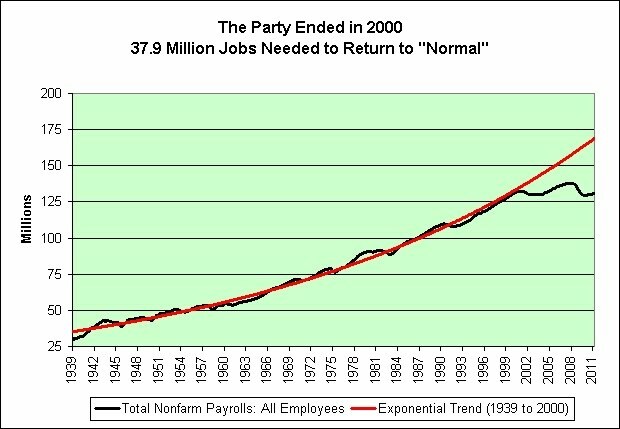 If it was our plan to stay on that 61-year employment trend well into the future, then there are now 37.9 million missing jobs. All exponential trends fail at some point. Sometimes it is difficult to tell when an exponential trend is failing. This is not one of those times. Kimberly-Clark is proposing to raise prices of baby care products in the range of 3-7% and around 7% for consumer tissues. For what it is worth, we have roughly 20-30 years worth of Kimberly Clark tissue (35,000+ tissues). All of it was bought over time with Costco coupons. We're pretty much done now. Sorry Kimberly Clark. We just don't have that much more future demand. Behold the power of Ben Bernanke's monetary policies in action. You can certainly get savers to spend but you aren't necessarily going to be happy with the long-term results. If you are wondering how we could possible use that much tissue, picture two people with seasonal allergies and one of these. I did another Costco trip. Generally speaking, price increases are still tame. On the one hand, Costco's Ghiradelli brownie mix just saw a 10% price increase. It rose from $8.99 to $9.89. It has been years since the last increase though. Keep that in mind. On the other hand, the toilet paper I use deflated slightly since my last purchase. Marathon brand is still trying to figure out how to compete with Kirkland brand it seems. First they tried 45 rolls (2812.5 square feet), then 40 rolls (also 2812.5 square feet), and now they are trying 48 rolls (2820 square feet, slightly more for the same price so slightly deflationary). I have yet to see anyone else buy that brand. Most seem to gravitate towards Kirkland brand. I guess they just assume it is cheaper since the price is lower. You get more paper with the Marathon brand though. I could go through the receipt further, but those were the most interesting developments to me. In other news, the ongoing Lenny Dykstra joke is really gathering momentum. It was my intent to heckle Cramer but it is getting a life of its own. "Charlie Sheen has absolutely nothing to do with posting the bond in the federal case," Dykstra's lawyer Mark Werksman told the News. "He's a friend and supportive of Lenny, but there's simply no truth to this rumor." Charlie Sheen? Doesn't that just figure! Check out the one comment (so far) on that post. See! I'm not the only one who finds the connection between Cramer and Dykstra funny, lol. Law enforcement sources tell TMZ ... the LAPD is investigating Dykstra for lewd conduct ... stemming from allegations made by a 47-year-old woman who claims she answered a Craigslist ad to be Lenny's housekeeper earlier this month. No mention of Cramer in that last link. I have no idea why I even bring it up. Yikes! ...ly into bankruptcy. Do not pass go. Do not collect $200. In the bankruptcy filings, Appliance Now cited the "historic, unprecedented decline in the economy, and the decreased consumer spending on home appliances specifically" for its financial woes. Why so gloomy? Haven't they heard the economy is roaring back? 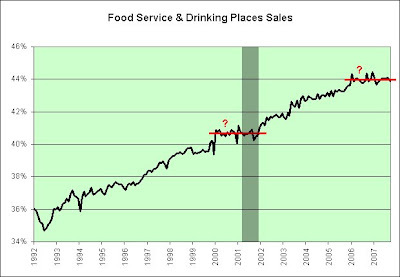 The chart shows the total retail and food services sales minus the amount spent at food and beverage stores, food services and drinking places, and gasoline stations. I then adjusted that amount for inflation and population. Is this new trend sustainable? I say no. As seen in the upper left hand corner of my blog, my short-term mood is currently inflationary. I think it may be temporary. I'm speaking from the perspective of a video game console owner of course. "While we are investigating the cause of the Network outage, we wanted to alert you that it may be a full day or two before we're able to get the service completely back up and running." Amazing. 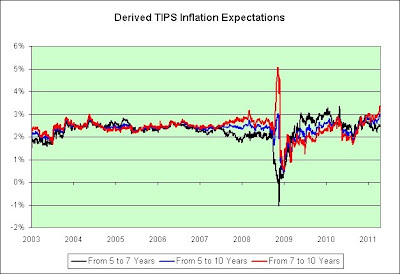 The TIPS pay 0.125% in interest and adjust for inflation but were bid up to the point they have a -0.18% yield overall. In this case, if you think inflation will be higher than 2.35% on average over the next five years, the TIPS are the better investment. It is like comparing two types of dung. Those who bought the 5-year TIPS without at least buying the 0.0% I-Bonds first were not thinking this through. 2. I-Bonds cannot deflate (even month to month). 3. At 0.0%, I-Bonds have a better rate. 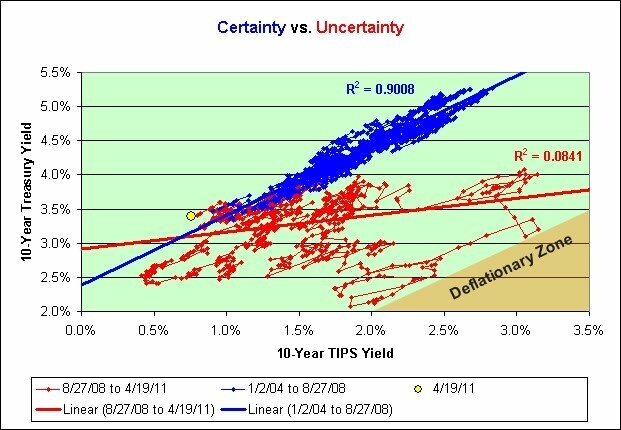 Based on those tender instructions and the Treasury's comments about negative yields on nominal bonds, I'd be somewhat surprised if the 5-year TIPS yield is below 0% during the next initial auction on April 21, 2011. I could be reading this wrong, but 0% does seem to be the floor during an initial auction. I suppose it is possible that the bonds can have a 0% floor in an initial auction but you still need to pay a premium to get that rate. It seems unlikely to me though. See here. The note about TIPS has been removed. This changes things a bit. There is apparently no interest rate floor on TIPS in an initial auction. 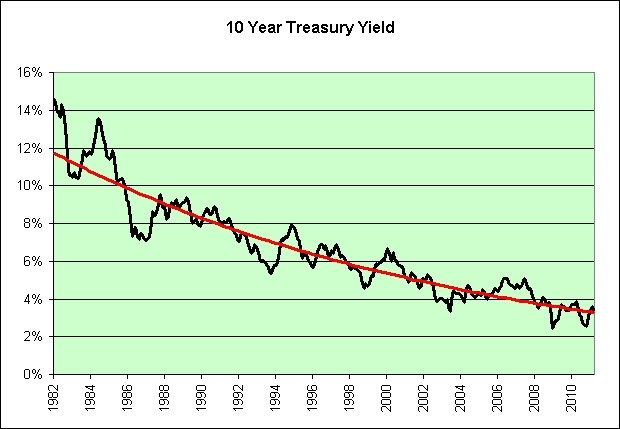 Investors can bid down the real yield as far as they like. Good to know. This will make it easier to someday recreate the stagflation of the 1970s in all of its former glory if we so desire. When I first started investing in TIPS back in 2000 I never imagined a day where investors would willingly accept negative real yields long-term. It was my thinking that the 1970s simply snuck up on investors. My mistake. Apparently it all just comes down to relative dung value. This chart uses data from 1952 through 2010. The Fed tells us our net worth each quarter (Table B.100) but does not adjust it for federal, state, and local debt (D.3). I have adjusted it. I'm working under the assumption that if the government takes on more debt then eventually I'll be asked to pay for some of it. Crazy thought I know. I was most interested in seeing the real net worth of the average person. This chart doesn't exactly do this justice. Income and wealth inequality has been growing. The average person therefore is probably not doing as well as this chart would imply. From what I can see, the real net worth of the average person has not risen since 1997 (other than temporarily through a dotcom bubble and a housing bubble). I would also argue that the future doesn't look much better. 1. Real interest rates are extremely low. When adjusted for inflation and taxes, it is very difficult to grow net worth safely right now. 2. Stocks have doubled in the last few years. 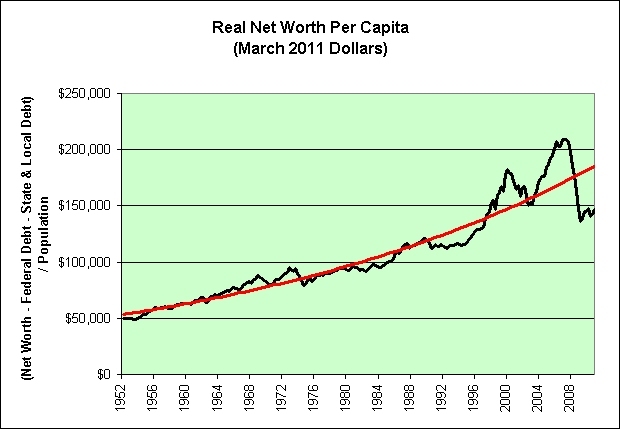 It is very difficult to grow net worth if you own stocks that aren't exactly cheap. 3. The housing market still looks bad to me. The NAR tells us that sales activity is up 3.7% in March but prices are down 5.9% from last year. Talk about painting lipstick on a pig. If the stock market did that we would call it panic selling. If is very difficult to grow net worth if your home's price is declining. 4. 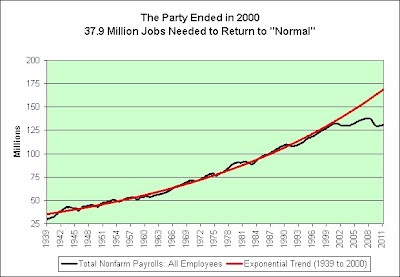 I believe the employment party ended in 2000 and nothing we do can bring it back to its former trend. It is very difficult to grow net worth if the employment situation is bad. 5. At some point, taxes will need to rise and the "free" lunch must end. 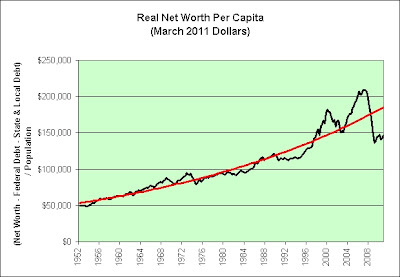 It is very difficult to grow net worth when taxes are rising. 6. At some point, the baby boomers will stop investing for the future and instead will begin to sell off what they have in order to fund their retirements. It is very difficult to grow net worth when a rather substantial portion of the population is hovering over the "sell" button. 7. 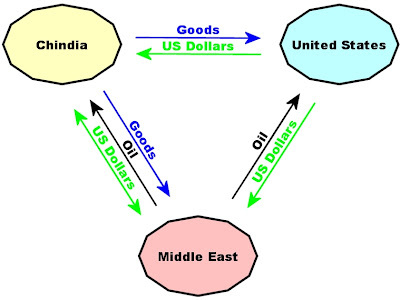 And lastly, there's our trade deficit. As seen within the link, "America’s Growing Trade Deficit Is Selling the Nation Out From Under Us." Those are Warren Buffett's words from 2003. I'm a believer in his theory. It is extremely difficult to grow net worth if our nation is being sold out from under us. Is it any wonder that I am still bearish long-term? First start with the exponentially declining yields on treasuries. 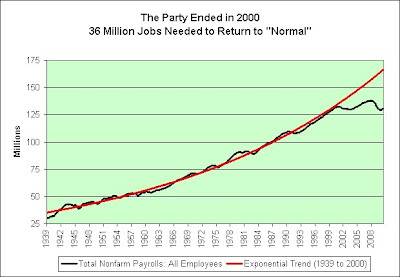 That's an exponential trend line in the chart and as you can see it matches the data very closely. 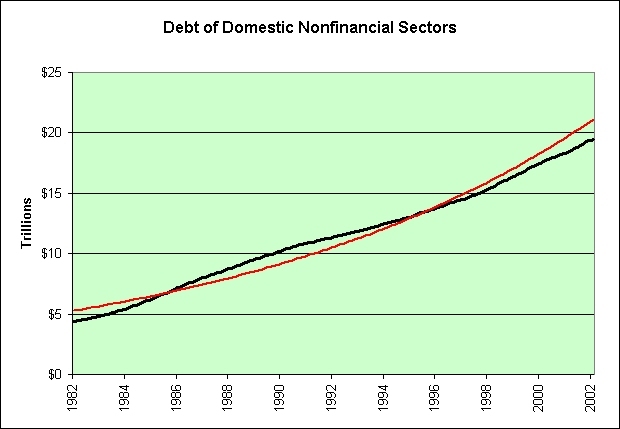 Now let's look at the exponentially increasing debt of domestic nonfinancial sectors. The data was discontinued in 2002 but I think it is close enough for government work. 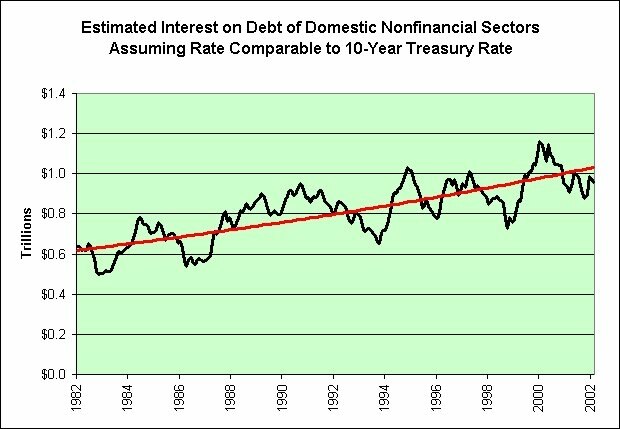 Now let's estimate what the interest payments on that debt would be if the rate was comparable to the yield of 10 year treasuries. Now let's adjust it for inflation over the years. What do you know? Thanks to exponentially decreasing interest rates, we can continue to borrow exponentially increasing sums of money with absolutely no consequences. Therefore, let's assume all trends remain in place to the year 2050. Should I start learning Japanese now or should I wait? Perhaps I should start now just to be on the safe side. On the other hand, perhaps all trends will not remain in place to the year 2050. We might not be that fortunate. I do not claim to know what the future will bring. I am simply trying to point out that we have been on the path to infinite leverage. How long this can continue is anyone's guess. 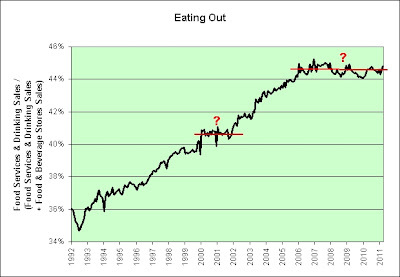 One should also keep in mind that I have cherry picked the starting point of these charts to the year 1982. That alone should be reason to suspect that these trends may not stand the test of time. The restaurant industry is not only an important source of jobs and careers, it is vitally important to the success of many other industries in the economy. As McDonald’s celebrates its National Hiring Day by adding up to 50,000 individuals to its roster, the National Restaurant Association has compiled a report of its research on the latest restaurant industry employment trends and the unique upward mobility that the industry offers. It's like something the National Association of Realtors would have written just a few years ago to show us just how important their industry is to the United States economy. Note that neither increasing the number of US housing units nor increasing the number of US restaurants can do much to alter that chart. I am therefore 100% convinced that neither building each other even more homes nor serving each other even more food will do anything to address our long-term structural problems. DirecTV, the largest satellite-TV operator, will offer a 48-hour rental of Sony Corp. (6758)’s “Just Go With It” for $29.99 just 10 weeks after the movie’s theatrical release in the first such service on pay television. This is fantastic news for the huge cross section of America which is too frugal to see movies in theaters when they first come out but too impulsive to wait just a few more weeks for a much better price. Would you pay $30 to rent "Just Go With It," an Adam Sandler movie that critic Richard Roeper calls "a pile of steaming crap"? Me neither. I offer two charts for your consideration. Inflation expectations can be somewhat determined by comparing the yields on 10-year treasuries with inflation protection (TIPS) to those without inflation protection. 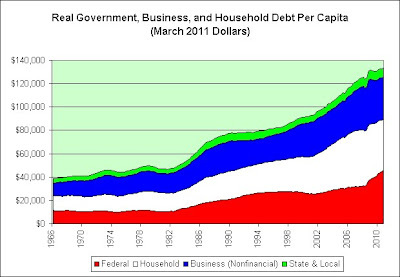 Ben Bernanke would have liked nothing more than to simply return to the blue line and restore a sense of normalcy. That deflationary zone in the lower right hand corner is his worst nightmare. Unfortunately, we had some momentum. We didn't stop when we hit the blue line. We just blew right on past it. The following chart is something you probably won't see elsewhere. If we determine the inflation expectations for 5 years, 7 years, and 10 years then we can also determine the inflation expectations from 5 to 7 years and from 7 to 10 years. When the inflation expectations from 5 to 7 years do not closely match the inflation expectations from 7 to 10 years then I would argue that there is some chaos in the system. 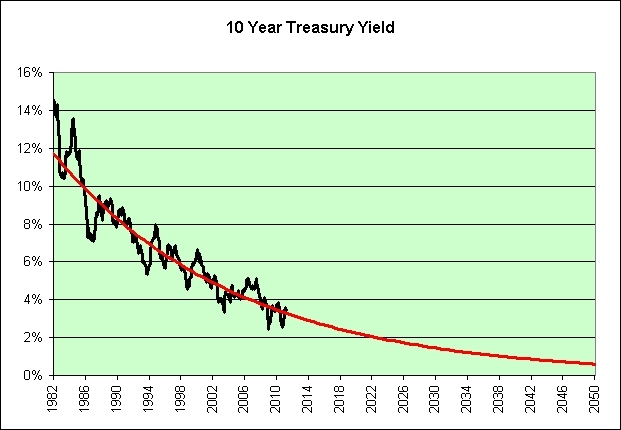 There's just no way the bond market can make predictions that far out with such accuracy. That's nearly a 1% gap. It isn't just because inflation expectations are higher further out. 20 year inflation expectations are 2.84% right now. I seriously doubt that the bond market has figured out that there will be a mini inflation bubble 7 years from now and it will last 3 years. Let's just put it that way. The danger here would be that inflation expectation gap continues to increase until something breaks again. 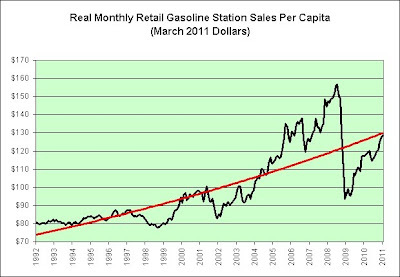 You can see that (deflationary) break in the chart in late 2008. It is not difficult to spot. In any event, the inflation expectation chaos that began in 2007 is not over yet. The chart clearly shows it. Perhaps these are merely aftershocks or perhaps we now live on a fault line. I'm tempted to think the latter. Nevertheless, the pervasive gloom about retirement is overdone. Fact is, people are quite creative at coming up with solutions. Among the key assumptions: A couple is 60 years old, each earns $100,000, and they have a total retirement portfolio worth $2 million. I have to admit that the article does make a great point. It is extremely difficult to be gloomy about retirement if we can assume that everyone has $1 million in retirement savings. This is America. There are 307 million people in this country. Let's pool our resources for the greater good. Once we build up a collective nest egg of $307 trillion, the pervasive gloom about retirement should be all but gone. Here's an added bonus. At the rate our country is exponentially increasing our rate of borrowing, $307 trillion shouldn't take many years at all. Woohoo! BOSTON (TheStreet) -- While investors consider hedging against inflation by buying Treasury-issued TIPS bonds, there is a question of whether they are worthwhile for the government itself. It's left billions of dollars on the table by issuing them. Disclosure: Nearly my entire nest egg sits in TIPS and I-Bonds. Will CNBC refer to information provided by Coast to Coast AM next? "Enquiring" minds want to know if UFO sightings will be included in the CNBC of the future. I'm not necessarily opposed I guess. They already have Jim Cramer's Mad Money. It might not be that much of a shocker. I keep track of every penny I spend. I am not seeing the inflation that Shadowstats claims, nor is the Billion Prices Project over at MIT. This post inspired me to actually give you a glimpse of my personal finances. 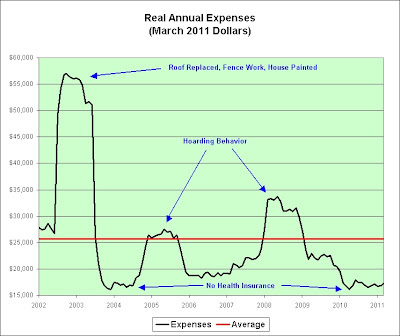 I've adjusted my annual expenses for the inflation the government reports to us. Here are some notes to go with the chart. * As you can see, I do not lead the life of the rich and famous. I'm quite frugal. I value my free time much more than I value spending money. * The chart does not include investments or taxes on those investments. It does include every other form of taxation though (including property taxes on my paid off home). * The chart does not include the financial support I offer to my unemployed girlfriend. * The period right now is very comparable to the period in early 2004. My standard of living is almost identical in every possible way. I had no health insurance. I had no desire to hoard. I had no unexpected expenses. I was equally frugal. As seen in the chart, the CPI claims that my standard of living is identical and I can tell you first hand that it pretty much is. 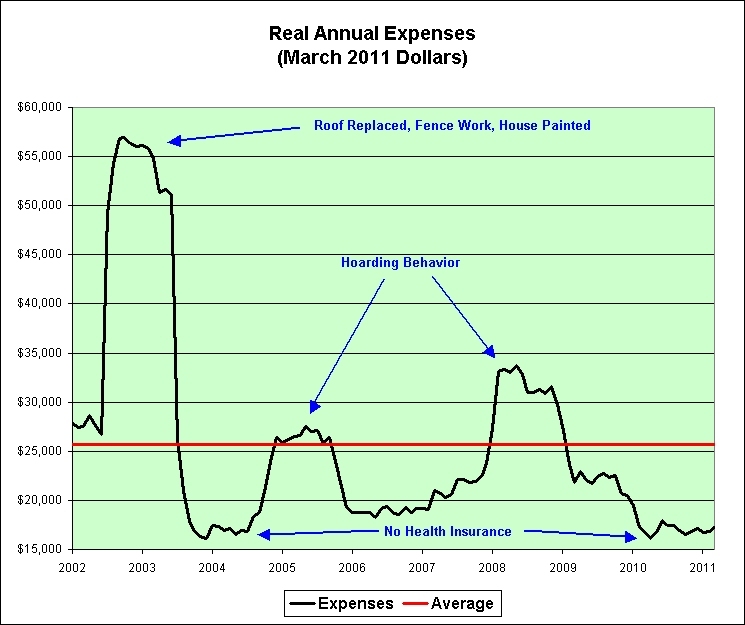 * My expenses tend to be lowest when I don't have health insurance and I don't have big medical bills. Go figure. I would prefer to have health insurance right now but I can't get it. I was denied. I should have it again by the end of the year though. 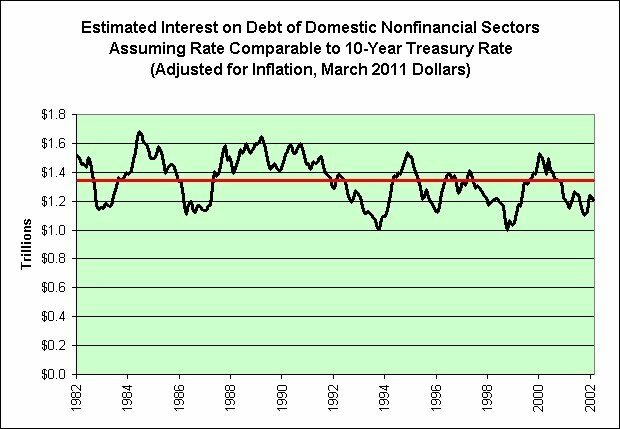 * Based on real interest rates, I'd be hoarding again right now. I've just run out of ideas it seems. Toilet paper is still cheap. Perhaps I'll buy even more of that. What's the harm? If inflation was running as hot as Shadowstats has claimed, the last 10 years would have financially ruined me. I'm not financially ruined. Therefore, I find their claims somewhat fishy to say the least. I cannot say what the future holds. I can say that inflation in the CPI has been relatively tame and the inflation I have personally seen has been relatively tame. The problem has come from the short-term income side. It is difficult to keep up with even tame inflation when 1-year treasuries are paying 0.24%. Should inflation pick up (again), I am fairly confident that the CPI will show it. 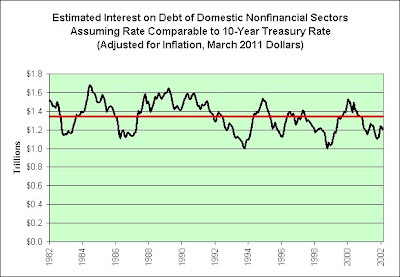 That is why I am still comfortable holding inflation protected treasuries and inflation protected I-Bonds long-term. I've spoken a lot about TIP on this blog in the past. It is now priced to lose purchasing power over the long-term. I want to offer a kudos to Barclays for offering the needed "real yield" information. It wasn't always there and in the past I had to estimate it by looking at the bond fund's holdings. What a pain that was. That's all you really need to know. The real yield is exactly absorbed by the management fees. 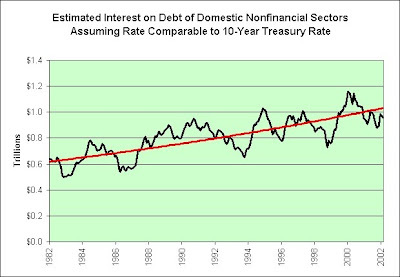 You are also exposed to fairly sizable interest rate risk since the average maturity is so high. It is possible to still make money over the long-term, but it does now require greater fools rushing in behind you. Once taxes are factored in, this investment should lose purchasing power. I-Bonds at 0.0% are clearly superior. You will still lose purchasing power due to taxation but at least you can defer the taxes. It's a bit like comparing two types of dung though. I'm a dung buyer. I'll be buying I-Bonds again in May. Sigh. As a side note, gold and silver should someday reach a point where they too will simply track inflation. That's the allure of them. Right? At that point, they too will lose purchasing power due to the taxation. They would become 0.0% real yield assets. When that day comes nobody knows of course. This is a hoarding toilet paper environment if ever there was one. The government can't tax the inflationary gains if you simply consume the products in the future. Just something to think about. I no longer own TIP. My last purchase was an ultra long-term TIPS bond and it has been treating me well so far. The real yield on that bond has fallen to 1.69% according to Bloomberg. The real yield infection continues to spread. Let's see where we are now. It has been 3 1/2 years since I posted that. 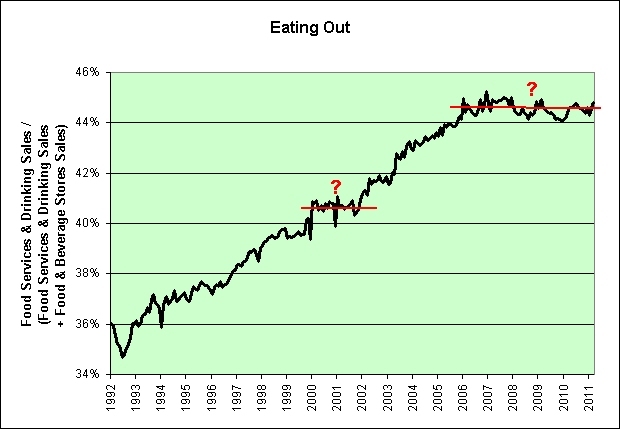 The trend of eating out more and more appears to be over. If true, that does not bode well for the restaurant industry going forward. As a side note, can you spot our recovery in the chart? I can't. Here's a new trend worth considering though. The exponential trend that was once thought dead has been resurrected. Way to go Bernanke. Hurray. 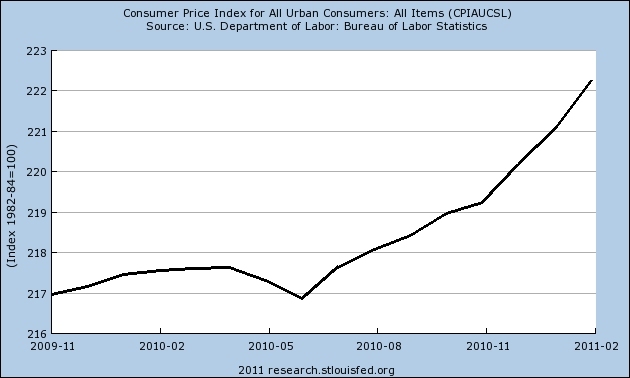 This is a followup to an earlier post that told us Bernanke is right to ignore the consumer price index. Scorn is a synonym for ignore. 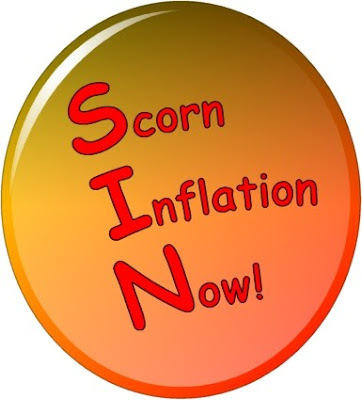 Scorn also has "corn" in it. That makes it the perfect word for those who love burning our food in response to higher oil prices. 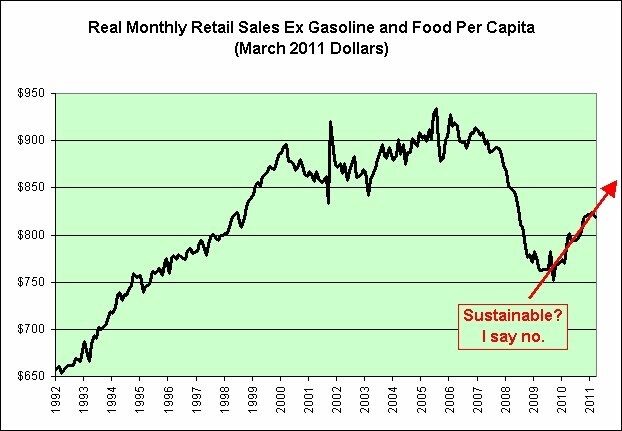 Of course, meat industry officials have been adamant that ethanol production is responsible, at least in part, for diverting significant quantities of feed corn and helping drive up food prices by escalating the cost of a key component of beef, pork and poultry production. Biofuel supporters, such as the pro-ethanol coalition Growth Energy, counter that the major drivers of increasing commodity and food prices are rampant Wall Street speculation that is fueling the soaring price of oil. Why must I choose between the two arguments? Of course, rampant Wall Street speculation would not be possible if there wasn't any money out there looking for a home. I'd therefore be tempted to blame something else as well. The restaurant industry faces a sobering image mess: how to convince consumers it will stop accidentally serving alcohol drinks to toddlers. "In an industry that serves more than 150 million meals every day, these are two extremely rare occurrences," the NRA statement read. "However, we believe that even one incident like this is too many." So what can be done to prevent accidents? The solution is so simple. I propose that we create a government bureaucracy to monitor all 300+ million citizens for any sort of suspicious accidental behavior. I was originally going to title this post "I'd Like to Waste a Few Minutes of Your Time" but decided that it would be more fun to waste a few hundred billion dollars of your money and perhaps even invade your privacy. What's in it for you? Two words: Lawn Darts. It has always been a pet peeve of mine that I am allowed to purchase a handgun but I am not allowed to purchase lawn darts. Where's the powerful lawn dart lobby when you need it? Can I count on your support? What if I told you that I would use the money to put all the unemployed people back to work? Every Department of Homeland Lawn Dart Security employee plays a vital role in securing our country and preserving our freedoms. We seek applicants from all backgrounds, from students to veterans to retirees. Become a part of our talented, dedicated and diverse workforce! The Department of Homeland Lawn Dart Security is an Equal Opportunity Employer. Would you be able to freely use lawn darts at your local park? Of course not. You'd need to pay for a permit. You would also need to be using government approved serialized lawn darts. I think that pretty much goes without saying though. I present this small offering to the Sarcasm Gods. I then quoted Jim Cramer. Lenny Dykstra, who played for the New York Mets and Philadelphia Phillies during his career, was charged with bankruptcy fraud for allegedly selling items from his $18 million mansion in Southern California without permission Wednesday and was nabbed Thursday for grand theft. If convicted, the charge carries five years in prison. Praise be to the Sarcasm Gods. On the one hand, I think it is arrogant to say that inflation can't stick. 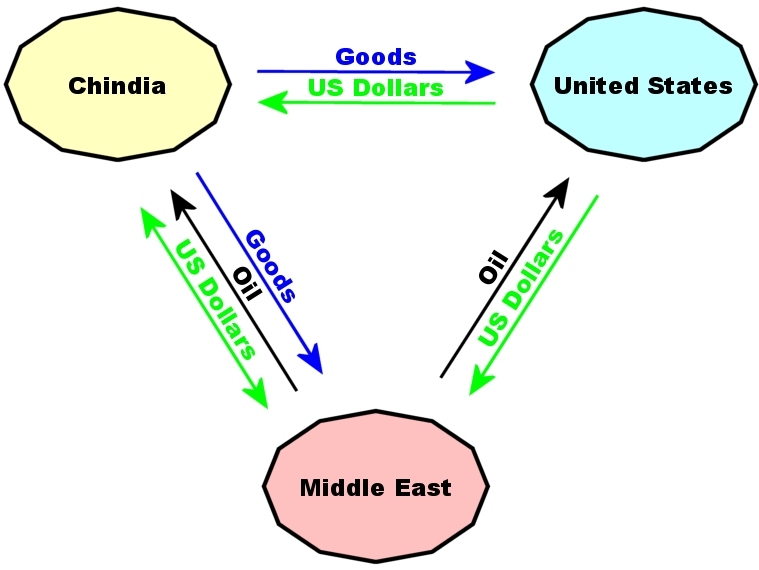 We have exported roughly $10 trillion (adjusted for inflation) in paper as part of our cumulative trade deficit. Surely that alone should make us at least entertain the possibility that inflation could occur. 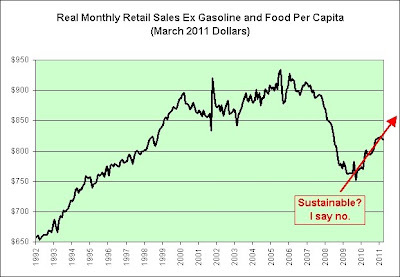 Further, the idea of ignoring the CPI seems more than a bit ridiculous to me. I might be biased though. The majority of my investments are tied to the CPI (TIPS and I-Bonds). On the other hand, I continue to believe we are trying to combine the deflationary Great Depression and the inflationary 1970s. I can therefore very much sympathize with the following quote from the article. I think it backs my theory. In sum, Levy believes the lack of wage growth means Americans won't be able to pay higher prices for very long, and the higher cost of food and energy will cause them to cut back on spending for discretionary items, like vacations and eating out. And on that third hand, Americans are not the center of the universe. If the universe determines that Americans will see inflation, then Americans will see inflation. 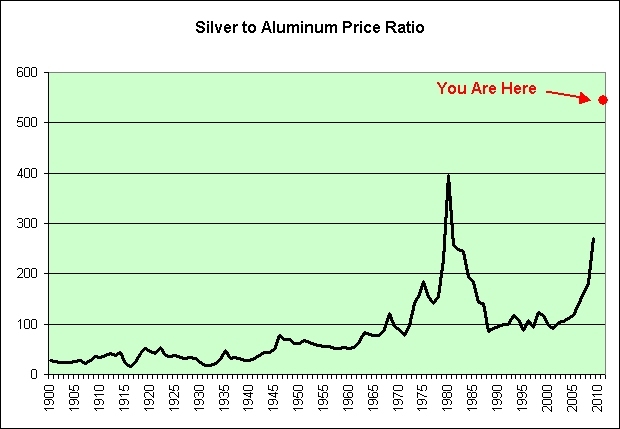 I do think we can see some of that in universal oil prices, universal gold prices, and universal silver prices. How much of that trickles into national toilet paper prices has yet to be determined. I'm predicting a fixed rate of 0.0% and a composite rate of 4.6%. That's a 2.30% increase over the six month period. Inflation has not been very tame. Here is a list of reasons why I think the fixed rate portion will be 0.0%. In all seriousness, there is no way that they are going to offer a rate greater than 4.6% on these I-Bonds. No frickin' way. Groupon pays the merchant upfront but keeps half the purchase price of each offer, plus a charge to the merchant for the credit card transaction fee. That adds up, for example, to less than $10 to the merchant for each $20 Groupon offer purchased. The consumer then redeems that offer for $40 worth of goods or services. From where I sit, merchants borrow $10 "upfront" but then need to pay back $40 worth of goods and services. “If the customer spends exactly $40, you lose money,” Benecky said. Sorry for not posting much lately. I should be back to posting somewhat more regularly in the next week or so. In the meantime, check out Survival and Prosperity. I added it to my blog list today. As a side note, be sure to check out the blog's About link. No mention of survival and prosperity would be complete without also including a quote from my latest water bill. 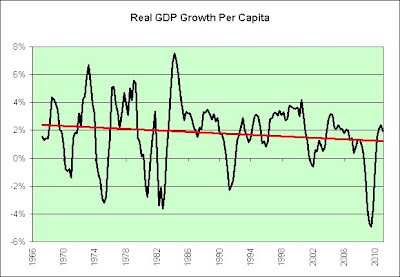 I think it shows just how strong our economic recovery has been. Added "Lien Fee" of $250 plus recording fees ($128) to cover increased administration costs associated with foreclosures. Also added $20 "intent to Lien" fee for the registered letters mailed to customers seriously delinquent and facing lien action by the District. Much can be learned from reading one's mail apparently. There were the crazy mortgage offers which made me concerned about the housing market back in 2004. Now there is the "intent to Lien" business. These aren't the business models we are looking for. One NS&I product not withdrawn from sale last year and that has gone on attracting business is Premium Bonds. Although the interest rate used to calculate the prize is a miserly 1.5%, there is a chance of winning the monthly £1m jackpot. NS&I manages around £98 billion in savings, 9% of the UK savings market. This accounts for 16% of the UK's national debt. As funds from NS&I are a relatively cheap source of government borrowing, the bank sets interest rates both to attract savers and provide low-cost finance for the government. Fatboy sez that Wal-Mart is warning us to prepare for serious inflation. 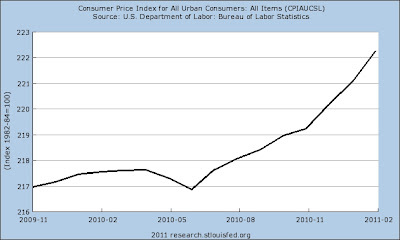 The Billion Prices Project is showing a real-time trend in inflation in the USA that is also not encouraging. Let's just say the trend is becoming a bit relentless. March does not look to be bucking the trend. As such, I am changing my short-term inflation mood to something decidedly more positive (as seen in the upper left hand corner of this blog). I last set it to deflationary in November, 2009. Here's what inflation has done since then. The CPI is up 2.4% over the past 15 months. That's fairly tame. The CPI is up 2.5% over the past 8 months. That is decidedly less tame. On the one hand, from a deflationary commentary perspective it appears that I have overstayed my welcome. The first 7 months were treating me very well but the party looks to be over. On the other hand, it is good to be a pessimist. My long-term inflation protected treasuries and I-Bonds are riding the wave. I can't say that it is an enjoyable ride, but it beats the heck out of burying cash in one's backyard. Further, investors have piled into the 30-year TIPS that I purchased back in February. I'm up about 10% on paper. 29 years and 10 months to go! That said, it doesn't really matter to me. I intend to hold until maturity. The term "prying them from my cold dead fingers" comes to mind. And lastly, this simply shows my mood. My mood is subject to change. For example, there is serious risk that $107 oil is not sustainable and that deflation will once again enter the headlines when we least expect it. Who really knows for sure? I received a letter in the mail from the IRS. It seems they want more money from me. I can only assume that it is related to April Fool's Day. This stems from the taxation of my inflation protected treasuries and what happened when deflation struck during 2009's tax year. Here's the amusing part, if you can call any of this amusing. For the first third of 2009 four of my bonds existed in Legacy Treasury Direct. I then transferred them to Treasury Direct. I did this to simplify and consolidate my holdings. While in Legacy Treasury Direct they racked up about $11,000 in deflationary losses. I have a 1099-OID from Legacy Treasury Direct showing that. For the rest of the year those very same bonds sat in Treasury Direct. They then racked up about $10,000 in inflationary gains. I have a separate 1099-OID from Treasury Direct showing that. Now the IRS is claiming that I owe taxes on the $10,000 in inflationary gains even though those bonds actually deflated by roughly $1,000 that year. So how did the IRS come up with the math for my new tax total? Easy. They simply ignored all the OIDs with negative numbers. Genius! My tax preparer said it will get resolved. No worries. Why is it that I always tend to worry more when I'm told not to worry? I also tend to worry more when people say they need to use special care when writing explanation letters. Let's just say there was a certain "don't poke the bear" quality to her words. And you know what really makes me worry? I would say that seeing a nice thick letter from the IRS would definitely be near the top of the list. Fortunately, I make every effort to accurately report my taxes. The information is all there. In theory, it should therefore be a relatively easy fix. I won't know for a month though. This is tax season so my tax preparer is really busy right now.